Oh, those pesky resumes. They always come with a Catch-22. You need to have a compelling resume to land a great job, but no excellent employer will consider you without having some great skills and experiences under your belt. But let me tell you this – you can craft a rockstar resume even if you are just out of college or worked some lousy or not-that-relevant jobs in the past. The trick here is to present your humble persona in the best light. Sticking with the right resume format that highlights your achievements and takes the attention away from specific career gaps you may have. Leveraging a few “unspoken” rules of career search that we are about to distill. So before you begin drafting that rockstar resume of yours, remember this. When companies want to sell their products, they know that they have to show value to a customer. What good will a product do for a customer? How does the product solve a problem for the customer? (Yes, people really do buy those airplane neck pillows, because the product keeps them from getting stiff and painful necks. It solves a problem). You need to solve a problem for a potential employer. The company needs someone with your skills, and you are the product he is looking for. Get the idea? No matter what resume format you use from the three we will be talking about, never forget that you are a product that can solve a problem. So align your pitch accordingly. Don’t talk about how well you did in school. Do highlight the relevant courses you took and how they helped you develop unique knowledge of the employer’s niche. Don’t just list what you did at your previous job, e.g. managed social media profiles for the brand. Do tell what you have learned and accomplished, e.g. increased the company’s following on Instagram by 35% in 6 months; built up a list of vetted influencers in the travel niche for ongoing campaigns. Instead of talking skills, talk achievements and results. That always strikes the right chord with a potential employer. You may have been the best dog walker or house sitter in the world while you were in college. And those part-time jobs were great for the extra money you needed. But you are in the big leagues now, competing for a job of substance. Your dog-walking career is irrelevant to a position in IT or teaching (unless you can equate training dogs and kids somehow). The point is this: Stick to the work or volunteer or internship experiences that actually relate to the position opening. If you spent your summers running day camp programs for kids, you have relevance to teaching. If you designed the website for your fraternity, you have some IT relevance. And show results when you can. Did you grow enrollments in that day camp program? Did your supervisor credit you with that growth and say so? Did your fraternity with the award for the best website on campus? Don’t be shy to reach out and ask for a performance feedback of some sorts from your former bosses. Then leverage their lingo and testimonials in your resume. For those already in careers and looking for a change, this same rule applies – the two “R’s” – relevance and results. Always highlight those! It’s no secret that lots of employers now use special tools to screen resumes. And if you are applying for a job with a Fortune 500 company, there’s a 90% chance that you will be up against such a tool. That software is looking for keywords and phrases that directly relate to the skills they need. But here’s the good news – you can guess those “power words” from the job posting, the position description, and sometimes from the company website itself. Don’t ever skip over this element in your resume construction. If you do, it’s a first-round knockout, and you are the one who is on the mat. No one buys a custom-made suit off the rack. And no hiring manager wants a generic resume either that was obviously recycled and sent to some twenty other companies. If you don’t bother with customization, why should they bother with taking the time to consider your application, right? The Content: Once you have made a list of the skills the position calls for and another list of how your skills are a match, you will have the meat for the body of your resume. And you can eliminate or minimize skills and experience that are not relevant. So, if you worked someplace for five years while you earned your degree, and that job is not related to this new position, minimize it. (Do include it, though, because you don’t want an employer to think you spent five years playing video games and living with your mom). A few short phrases about what you did and that this was an interim job while you worked toward your degree will be fine. And just another important tip about your content. If the company is conservative, your language style must be very formal. If the company is a progressive startup that has just moved out of someone’s garage to an old warehouse building, you will want to be far less formal and toss in some jargon. Whatever the case, though, make sure there is not one typo or comma out of place. That Resume Format: Aye, here’s the rub. And here’s why resume formats differ. Depending on the employer and your specific situation, you may want to use a chronological, a functional, or a combination format. More on that later, but keep in mind the fact that the resume format you choose will differ by position, by employer, and by your background. 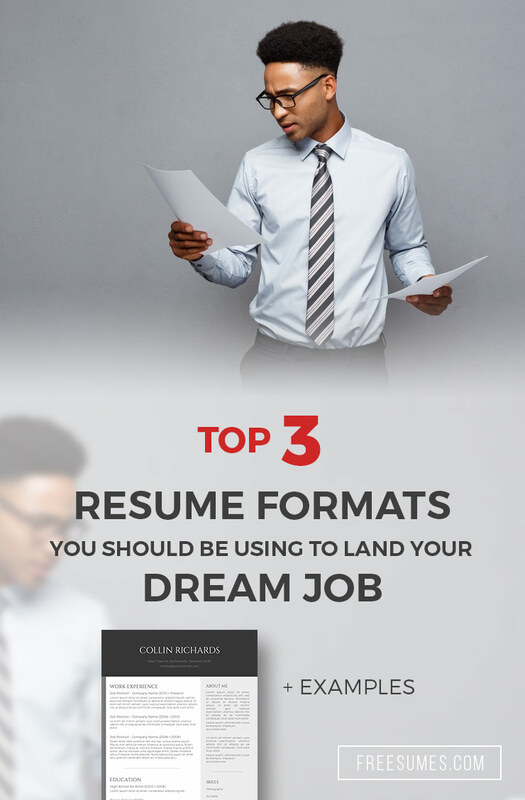 As the title says, there are three basic types of formats for resumes – chronological, functional, and a combination of the two. Each of these formats serves a different purpose for candidates with different backgrounds, job histories, and skill sets that they want to present in the most compelling way. So, let’s take a look at these three types and who should be using them. The body of this type of resume is organized by job title and structured in reverse order of the current or most recent position, moving backwards to the earliest job that you will be including. Basically, it matches your LinkedIn profile (and I hope you have one setup and polished up!). Also, you may want to include a resume objective or a career summary before listing up all that work experience. 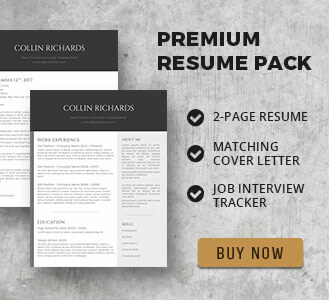 This is a resume that is an “easy” read for employment managers and recruiters. They can scan down the work experience and the job titles you held. The other notable feature is that they can see the progression of your career up to your most current position. If you have gaps in employment, they will really show up on the resume format. And, if your career progression looks a bit illogical, that will show up as well. Employers will be left wondering. And wondering is not a good thing. If there are other candidates with a significant employment progression, their resumes will be placed on the top of the pile for further consideration. Who Should Use a Chronological Resume? Demonstrates a progressive and increasingly more responsible work history, without gaps and that does relate to the position opening. Shows a most recent or current position that is a great match for the skills and talents the employer is looking for. Presents a work history in organizations similar to the one that has advertised in this opening. The header should include your name and your contact information. Now, this contact information should include your email address and a working phone number. Adding your address is just taking up space. No one is going to send you a snail mail letter or drive by your home to check out your digs. The other potential issue is if you live in another town or state that that of the company. Employment managers may want to look at local candidates first. No reason to raise that relocation flag just yet. Usually, educational background comes next, but many chronological resume formats place this after work history too. And let’s be honest here. If you have a college degree, employers already know you graduated from high school. Leave it out, if only in the name of saving a line on the document. Work history comes next, and remember it is in reverse order. Other information that may show your value can be included in a separate section. If you received any relevant awards; if you have community leadership positions, briefly describe them. No need to be a braggart here, but they can tip the scales a bit in your favor. While these are probably not the favorites of most hiring managers, they do serve a purpose for candidates, whose situations may be unique. This resume format focuses on skills and abilities as opposed to specific work history. For candidates whose work history is not really a “match” for what the hiring manager may be looking for, focusing on skill sets rather than companies worked for can be a better option. And for candidates who have gaps in employment, these are downplayed in a functional format. 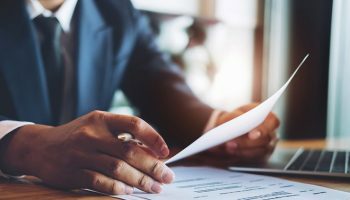 This resume structure is more difficult for employers to scan, and unless your opening is stellar, many will not take the time to review your document. Who Should Use the Functional Resume Format? As stated, if you have either gaps in your employment or the companies you have worked for are not similar in “culture” to this one, then this will probably be your best option. The other job seeker who should consider a functional resume is a “newbie” who is just entering the career field. Obviously, you don’t have a work history to fill the body of a chronological resume, so you are better off trying to focus on the skillsets you have developed through internships, coursework projects, leadership positions, etc. 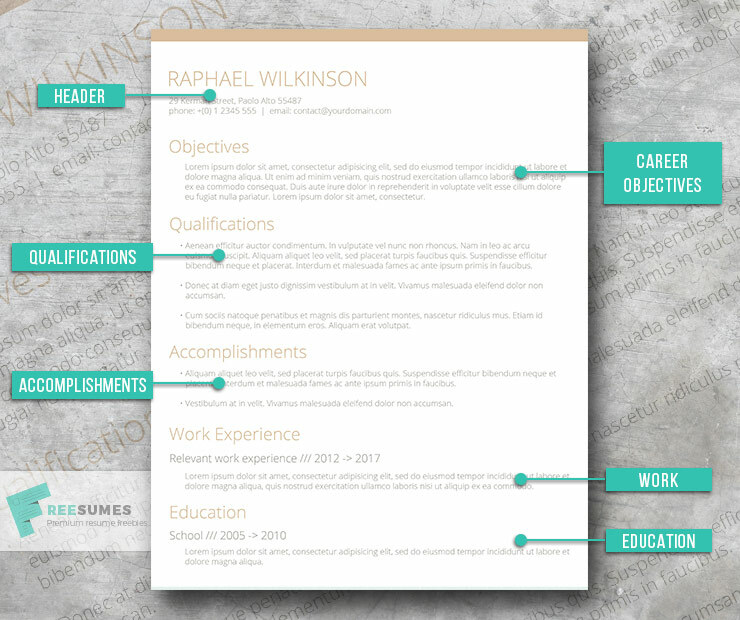 Begin with your header as you would with any resume (see chronological above). 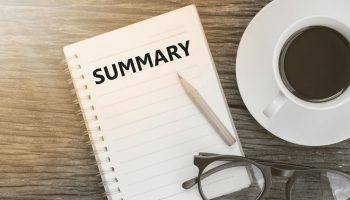 Think about creating a compelling summary – one that addresses the skills you have that are a “fit” for the position. Going back to the concept of yourself as a product, remember it’s not about you; it’s about the value you can bring to an organization through your skills. This may help your resume stand out a bit more than most if you are brief and very creative with your presentation. Following the summary statement, organize the body of your resume by themes – each theme should be a skill that will provide value to the organization and relate to what they are looking for. The first theme should be what you believe to be the most important skill/talent they are looking for and then move down in descending order of importance. If you can include results, by all means, do so. Remember that fraternity website award? That’s a result. Don’t forget those keywords. You need to splatter them throughout your themes. You don’t want some machine giving you the boot. Mention projects you have completed or been a part of. This is especially important for candidates who are right out of school, but also for seekers who have worked on significant and highly related projects. And if you held any leadership positions in collaborative projects, say so. Mention employment history if you have it. You do not necessarily have to give dates of employment and put that history at the end, so it is not sticking out like a tumor. A strong cover letter should be in order here. You can get in those all-important keywords and also highlight the skills that make you the perfect “fit” for their needs (not yours). 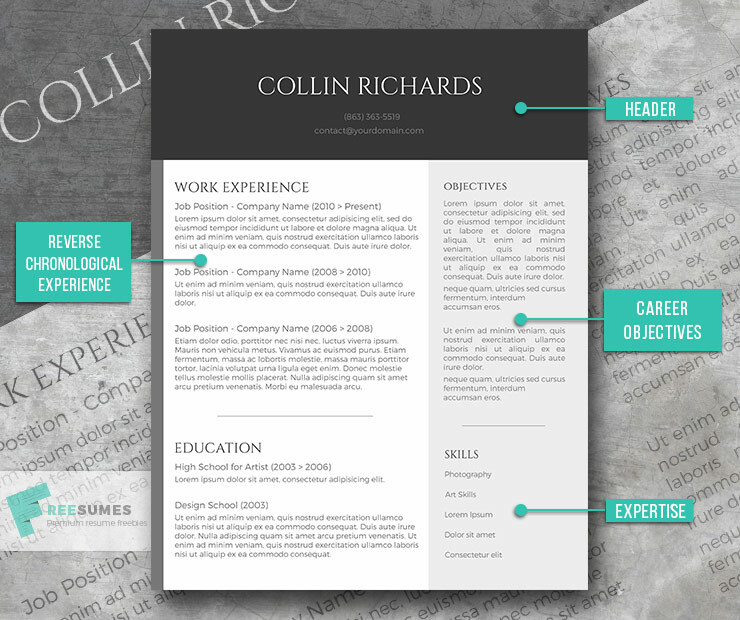 This resume focuses on skill themes as the functional one does. However, these “themes” are then followed with a much more detailed work history. You can begin by highlighting the skill sets that are most relevant to the position offering, even if your work history is not with similar organizations. You can make any gaps in employment less noticeable. Just like with the functional resume, hiring managers may not want to read through your themes and may go directly to your chronological work history. This can be a problem is your work history does not reflect the skills you have gained over time. Who Should Use a Combination Resume? If you have had positions in a completely different career field, it will be hard for a hiring manager to see how you will “fit” into his organization. By highlighting your skills first, the reader will become more comfortable with your potential fit. This format also helps to minimize employment gaps. It is probably not a good format for new grads looking for their first position – there is little to no work history to include. Place your qualifications summary at the top of the body. This will be much like the summary used in the functional resume and focus on a very brief description of the value your skills can bring to an organization. Each section should focus on a “theme” as in the functional resume. And each theme needs to relate to a skill/talent that was contained in the job description posting. Don’t add skill themes you can’t back up and don’t add any you think are great but that don’t relate. No one will really care about those. When you get to work history, you may have some that is a good “fit” and some that is not. If this is true for you, divide that work history into two sections – related and non-related (call it “additional work experience” or something like that). Within those sections, make the history chronological, in reverse order. And this is kind of a good way to “hide” gaps too. 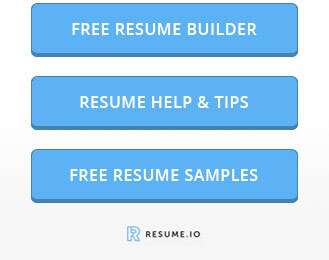 So, there you have it – the three resume formats worth using. And, even with all of this great information, are resumes still pesky things to craft? You bet they are. 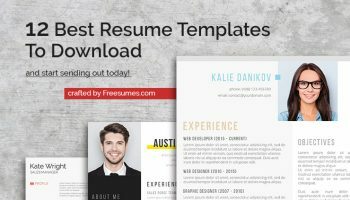 Once you have decided which format is best for your situation, make sure you look at a bunch of resume templates for that format before you rush headlong into yours. Enough said – now go out there, do your research, get the right format, and remember the “rules” as you go!